My first impression once inside was a good one – I was greeted and seated right away, the service was pleasant and attentive, and the decor and cleanliness of the restaurant were noticeably above-average for a Chinese restaurant. 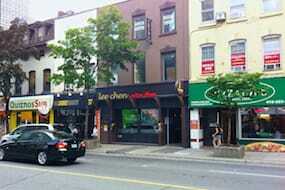 This place has a very modern and appealing look to it – kudos to them for that. Unfortunately for me, however, it turned out that Lee Chen’s dim sum menu was a lot smaller than I anticipated so I knew I would probably be best off ordering something else from their lunch menu. 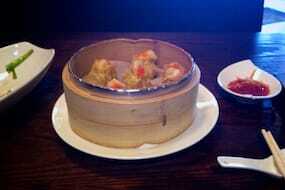 I ordered Shanghai Noodles (one of my favourite classics), as well as Chicken & Shrimp Siu Mai. The Shanghai Noodles were a little bland but had a harsh bitterness to them, probably the result of too much garlic, onion and cabbage stems. (Shredded cabbage? Good. Shredded cabbage stems? Not good.) 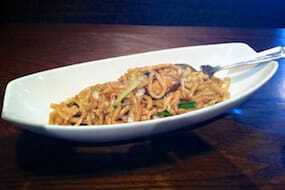 The biggest turn-off, however, wasn’t the flavor, but just how unnecessarily greasy the noodles were. It may as well have been listed on the menu as an oil-based soup! 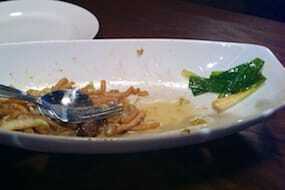 You can see from the iPhone photo above just how much oil there was on the bottom of the serving plate, but what you don’t get to see is how much oil I ingested, and how much oil there was sitting at the bottom of my bowl… (I always eat Chinese food out of a bowl and with chopsticks – it tastes better that way.) It was nice to see that they weren’t your typical heavy, dredged-in-soy-sauce food-court noodles, and the fact that they came with a lot of large mushrooms was also really nice, but they were literally swimming in oil and that made them very hard to enjoy. Way too greasy! My first impression of the Chicken & Shrimp Siu Mai was also very lack-luster – they were noticeably overcooked and quickly formed a dry skin on top as they cooled at my table. Having these made with chicken and not pork (as is traditional) yielded a much more grainy texture, but they were very juicy inside like a soup dumpling. The first dumpling I tried plain, but once I had the next one with the pickled ginger and red vinegar sauce, that changed everything. That first dumpling seemed wasted in comparison – you really should have these dumplings with that sauce and a generous amount of pickled ginger, it makes a huge difference! 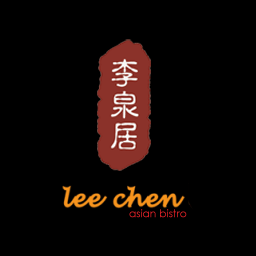 Lee Chen Asian Diner was published on Saturday, June 23, 2012 at 10:30am EDT by Daniel Menjívar and last updated on April 11, 2018 at 9:30pm UTC .